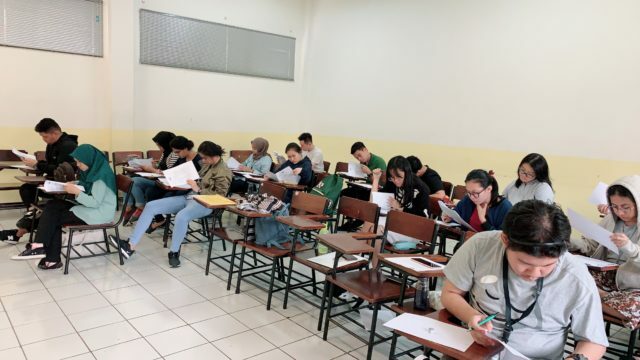 It’s time for the mid semester test period at Bina Nusantara University. This period is obviously an important time for students. If you can get a good score in these tests it takes the pressure off when the final tests come around. With this article we’d like to offer a few tips so that you can do your best. Schedule your preparation time.You need to study the material from your courses before you take the test. Therefore, look at the week ahead of you and pencil in the times at which you are going to study. Please see the post on blocking time in your calendar for more help. Break your study periods up into manageable periods. For example, imagine you allocate a complete afternoon for study. Let’s say this is 3 hours. You should break the three hours into smaller sessions with 5-10 minutes break between. Make sure that any one period of study does not exceed 45 minutes. In this example you could divide the afternoon like this: three sessions where each session = study 45 minutes + break 15 minutes. Doing things this way makes time fly!!! Review everything!You won’t remember key information until it is repeated. Therefore, at the start of the day you should review your study notes from the previous day. Take notes.Until you write stuff down there is very little chance you will gain full understanding. As you go through the articles, slides and chapters related to the subject you are studying make sure that you take notes on all the important points. It doesn’t matter if you did this already at lesson time. Do it again! It will help you to remember. Form a Teaching Group.It is widely accepted that the best way to learn something is to teach it. This is a great opportunity for many students in Indonesia because they like to study together. You simply need to create a group of friends consisting of about 4-5 people. Each person is allocated a lesson/ chapter/ unit to teach. Decide on a time and date for your group to teach each other. Before this date arrives you need to take some time to prepare your ‘lesson’ – make some slides and handouts to give your friends.